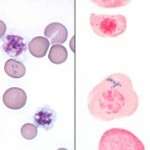 Red blood cell inclusions can arise from a variety of sources. Correct identification of these abnormalities is important since it can provide insights into metabolic, physiologic, and pathologic conditions affecting the red blood cells. Basophilic stippling represents the spontaneous aggregation of ribosomal RNA in the cytoplasm of erythrocytes. 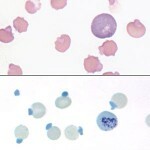 These aggregates stain, and hence are visible, with routine hematology stains. As a feature of regenerative anemia: This occurs especially in ruminants (but also in dogs and cats). In this setting, most of the stippling is seen in young red blood cells (i.e., polychromatophilic or normochromic macrocytes). Lead poisoning: Basophilic stippling can also occur in the absence of anemia in animals with lead poisoning. In this situation, stippling results from the poisoning of the 5′ nucleotidase normally responsible for degrading RNA, and hence may be seen in older, smaller red cells as well as nucleated red blood cells. Increased numbers of nRBC (erythroblastosis) usually accompanies the stippling in this condition (as does polychromasia). Oxidation of exposed sulfhydryl groups on hemoglobin causes formation of disulfide bonds and distortion of the tertiary structure of the hemoglobin molecule. 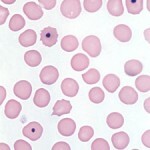 The result is precipitation of hemoglobin, which may then coalesce to form intracellular inclusions called Heinz bodies. Small, non-pathologic “endogenous” Heinz bodies can be found in blood of many healthy cats, but their presence is abnormal in other species. Increased numbers of these “endogenous” Heinz bodies are found in cats with diabetes mellitus (associated with ketone production), lymphoma and hyperthyroidism. Although many of these cats are not anemic, their red blood cell lifespans are reduced and they have lower hematocrits than cats with the same disease but lower numbers of Heinz bodies. Heinz bodies may be seen in Wright’s stained smears, especially if they are large and distort the red cell membrane. In contrast, small “endogenous” Heinz bodies, such as those that can be seen in cats, are harder to visualize. Heinz bodies can be easily observed with supravital stains, such as new methylene blue, as illustrated in the picture below. Extensive Heinz body formation and attachment to the membrane increase the rigidity of the red blood cells and render them susceptible to fragmentation and entrapment in the spleen where they are phagocytized. Inherited disorders: Enzyme deficiencies (necessary for enzyme function) in pathways that guard against oxidant injury can result in oxidant-induced hemolytic anemia, e.g. Glucose-6-phosphate dehydrogenase (G6PD) in horses, or methemoglobinemia, e.g. flavin adenine dinucleotide (FAD) deficiency in horses. Toxins: Wilted red maple leaves (horses, camelids), Pistachia species (horses), Brassica spp. (kale, turnips; cattle), zinc (dogs ingesting pennies minted after 1982), copper (sheep), skunk musk (dogs, red panda), naphthalene (dogs), nitrate (cattle), onions. Drugs: Acetaminophen, vitamin K1, phenothiazine drenches, benzocaine, propofol. These act as oxidants. Mineral deficiency: Selenium is necessary for the function of enzymes that protect against oxidant injury. Selenium deficiency in cattle can result in oxidant injury to red blood cells. 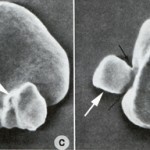 Howell-Jolly bodies (also called micronuclei) are small fragments of non-functional nucleus which were not extruded as the erythrocyte left the bone marrow. Usually, but not always, the host erythrocyte contains only a single Howell-Jolly body, which appears as a blue, perfectly round inclusion. Occasionally, uneven staining of an Howell-Jolly body can result in a ring-like appearance which may mimic a parasite. In dogs and ruminants, Howell-Jolly bodies are not routinely observed in peripheral blood because they are removed from red blood cells by the pitting function of the sinusoidal spleen. In normal cats and horses (non-sinusoidal spleens): Howell-Jolly bodies are not removed as readily as in dogs or cattle, so low numbers may be seen. Compromised or absent splenic function: Corticosteroids, splenectomy. Erythroid dysplasia: In non-anemic miniature and toy poodles with hereditary macrocytosis, increased numbers of Howell-Jolly bodies (some abnormal and fragmented) may be observed. 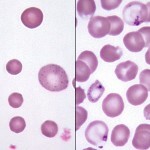 Similarly, abnormal and increased Howell-Jolly bodies may be seen in myelodysplastic syndrome (primary myelodysplasia). DNA replication defects: Increased numbers of micronuclei in murine models indicates defects in DNA repair or replication (Dertinger et al 2011). Siderocytes are anucleate erythrocytes with iron-containing (siderotic) cytoplasmic inclusions. The inclusions can be due to aggregates of iron in the cytoplasm or within mitochondria (the latter are called Pappenheimer bodies). A nucleated erythoid cell with the same inclusions (usually within mitochondria) is termed a sideroblast. Siderocytes should be distinguished from basophilic stippling (aggregates of RNA) because they mean different things. Generally, siderocytes have small focal accumulation of light blue to grey material, whereas basophilic stippling is more chunky and diffusely distributed throughout the cytoplasm. Siderocytes will also stain blue with Prussian blue reaction (detects ferric iron), if the iron is in sufficient amounts to readily visualize (small amounts do not stain well with Prussian blue). Hemolytic anemia: Increased iron turnover can result in siderocyte formation, e.g. immune mediated hemolytic anemia. Siderocytes are seen most frequently in dogs with hemolytic anemia. Abnormal heme synthesis. Iron may accumulate in RBC if hemoglobin production is inhibited. This can occur with drugs (e.g. chloramphenicol), lead poisoning, and vitamin B6 and copper deficiency in pigs (B6 is required for heme synthesis and copper is also required for release of iron from macrophages and enterocytes). Another drug associated with siderocytes is hydroxyzine, presumably due to alterations in heme synthesis. Siderocytes have also been seen in some dogs with portosystemic shunts (may be due to abnormal iron metabolism with iron accumulation occurring in RBC). Siderocytes can be a feature of dyserythropoiesis due to myelodysplastic syndrome and acute myeloid leukemia in cats (but generally are not seen in dogs with these disorders). Acquired dyserythropoietic syndromes with siderocytes have been described in dogs (Canfield et al 1987, Weiss 2005).